Thanksgiving is the unofficial beginning of the holiday season, and with that, many of us will be preparing for an array of feasts and parties. Let’s not forget our furry friends with our planning! Below are some wonderful safety tips to keep our friends safe and healthy. Keep the feast on the table - Eating turkey or turkey skin, ham, and other popular holiday main dishes – sometimes even tiny amounts – can cause digestive distress (not a party you want to go to!) or could even lead to a life-threatening condition in pets known as pancreatitis. Fatty foods are hard for animals to digest, and many foods that are healthy for people are poisonous to pets – including onions, raisins and grapes. If you want to give your pets a treat this holiday season, consider making or buying items that are specific to their needs. It is also worth informing your guests that your animals should not get any table treats. It is easy to give them too much when you don’t know what they are getting from others! Limit the Sweets - Chocolate can be harmful for pets, even though many dogs find it tempting and will sniff it out and eat it. Small amounts will give your dog an upset stomach with vomiting or diarrhea. Larger amounts could cause muscle tremors, seizures, and/or heart problems. The artificial sweetener called xylitol – commonly used in gum and sugar-free baked goods – can also be deadly if consumed by dogs or cats. This chemical can cause low blood sugar, seizures or liver failure in dogs. Yeast dough is a no-no - Ingesting raw yeast dough can cause serious problems including painful gas and potentially dangerous bloating. If a dog eats unbaked bread dough, the dough can expand in the warm stomach and cause a condition called “bloat”. This can lead to a twisted stomach in dogs and can be deadly. Put the trash away where your pets can’t find it. 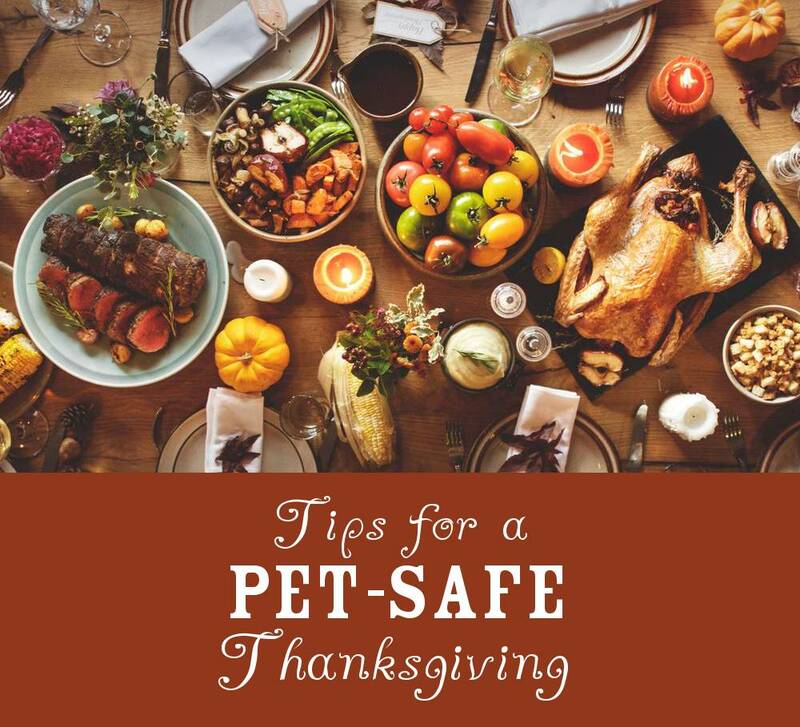 - A turkey carcass could be dangerous to your best four-legged friend. Make sure to dispose of turkey carcasses and bones – and anything used to wrap or tie the meat, such as strings, bags and packaging – in a secured trash bag – and make sure that bag is in a secured trash container. Many good doggies have proven to be incredibly inventive when it comes to getting to yummy leftover bones. Below is a quick list of Good/Bad foods for dogs! If you believe that your animal may have ingested a potentially dangerous substance, call your veterinary’s office, or Emergency Animal Hospital immediately. You can also call the ASPCA Animal Poison Control Center at (888)-426-4435. It is a great idea to have these numbers ready before you need them!